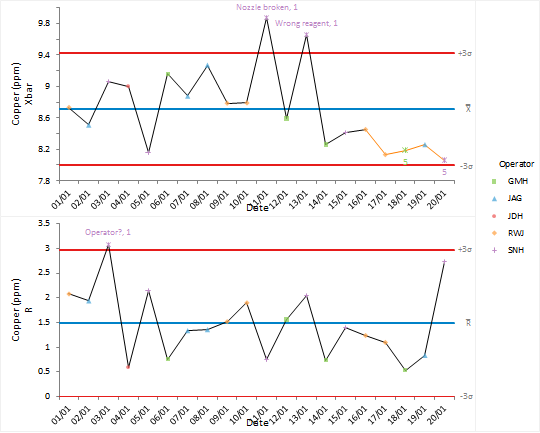 Effective use of control charts requires periodic revision of control limits when changes to the process cause a reduction in variability or shift to a new operating point. On the Analyse-it ribbon tab, in the Process Control group, click Apply Rules, and then click Montgomery. In the Rules grid, clear the check boxes next to rules 4,6, 7 and 8. The standard Shewhart control limits are good at detecting large shifts but are not sensitive to smaller shifts. Applying advanced out-of-control rules has identified a shift to a new process mean towards the end of the installation period suggesting that the process was moving to a new phase.